Once in a great while comes an ensemble composed of innovative individuals with unwavering beliefs and high standards about their respective industry; enter Société-Orignal. Based out of Quebec, Société-Orignal is a forward-thinking collective, integrating farmers, activists, chefs and grocers alike to revolutionize the way we think about food. Their mindful approach sets them apart, and it is something that comes through in their impeccable product line. Le Marché St. George is happy to announce that we are now stocking their goods on our shelves. Today's post highlights their Balconville (apple cider vinegar), Café de Fleur (wild herbal tea), and Classe Ouvrière (seashore honey). 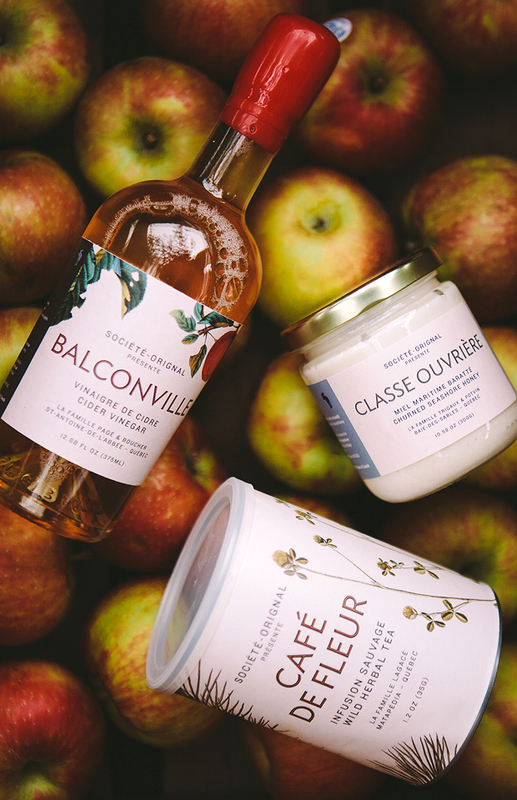 Balconville is made from late-harvest apples from Montérégie, a region in Quebec that trickles into the United States' well known for their awe-inspiring apple orchards. The apple cider vinegar is then fermented through a meticulous process free of ullage, which diminishes oxidation in the final product, allowing for the natural purity of the sugars, tannins, and acid of the apples to take centre stage. Café de Fleur is a finely curated medley of plants (handpicked by herbalists with adherence to a botanical calendar), ensuring each plant is harvested in its prime. Matapédia, the heavily-forested region in Eastern Quebec provides a lush selection of coltsfoot, balsam fir, red clover and labrador tea that make up this exquisite product. Classe Ouvrière is a product that Tyler Gray of Mikuni Wild Harvest raved about in his interview with me (read by clicking here) during the company's first and only pop-up shop to date. The marshmallow crème texture of the honey makes quite an impression on the palate. It is unpasteurized, and completely unlike any honey you've savoured before; sensationally sweet and its floral notes are provided by the summer pollen of wild flowers, located in Gaspé (on the south shore of the Saint Laurence River in Quebec).